Device invisibility is the hidden enemy of any organization. How are your critical business devices performing? If you don’t know the answer to this question, it could be affecting your bottom line. According to VDC Research, each time a device fails you could be losing an estimated 80 minutes of productivity. * Each time a mobile device is lost, stolen or not charged properly, it costs you money. And each time a device sits idle, it increases the overall cost of ownership of your assets. That’s why Zebra’s Visibility Services Portfolio gives you important insights into the health, usage and performance of your mobile computers and printers. The Zebra OneCare services portfolio goes beyond traditional repair services with additional options to deliver advanced visibility and predictability in your operations – to give you greater peace of mind. 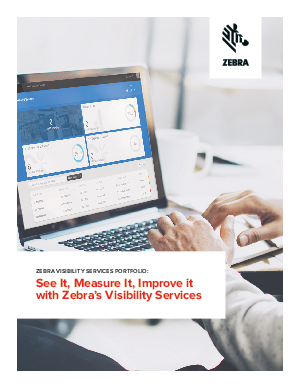 Zebra’s Visibility Services Portfolio gives you visibility into device availability, device usage and operational asset workflow to help you optimize your business operations. Zebra’s wide range of visibility services allow you to maximize uptime by anticipating and proactively addressing potential issues before they affect your bottom line.